For other uses, see Currie (disambiguation). 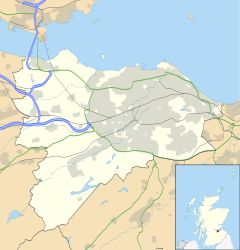 Currie (Scottish Gaelic: Currach) is a suburb of Edinburgh, Scotland, situated 7 miles south west of the city centre. A former village within the County of Midlothian, it lies to the south west of the city, between Juniper Green (NE) and Balerno (SW) on the Lanark Road. Administratively, Currie falls within the jurisdiction of the City of Edinburgh Council. It gives its name to a civil parish. In 2001 the population of Currie was 8,550 and it contained 3,454 houses. There is no accepted derivation of the name Currie but it is possibly from the Scottish Gaelic word curagh/curragh, a wet or boggy plain, or from the Brythonic word curi, a dell or dirt hole. The neighbouring suburb of Balerno derives its name from Scottish Gaelic, whilst the nearby Pentland Hills derive their name from Brythonic, so either is possible. The earliest record of a settlement in the Currie area is a Bronze Age razor (1800 BC) found at Kinleith Mill and the stone cists (500 BC) at Duncan's Belt and Blinkbonny. There are a few mentions of this area in mediaeval and early modern documents. One of the first is when Robert of Kildeleith became Chancellor of Scotland in 1249. Kildeleith means Chapel by the Leith, and survives today as Kinleith. Robert the Bruce gave Riccarton as a wedding present in 1315 and in 1392 the land passed to the family of Bishop Wardlaw. In 1612 the land went to Ludovic Craig, a Senator of the College of Justice. In 1818 it passed to the female line and became the property of the Gibson-Craigs. There has been a Christian community in the area for more than 1,000 years. In 1018, the archdeacons of Lothian set up their headquarters in the area. John Bartholomew's Civic and Ecclesiastical maps of the 13th century do not show Currie, but the Index of Charters 1309-1413 records Currie as being 'favourite hunting grounds' for the Lords and Knights of Edinburgh Castle. A settlement began to take shape around Currie Kirk and the main Lanark Road, which was the main route south and continues to be known as 'The Lang Whang'. The weaver poet James Thomson was brought up in the village in the late 18th century and is commemorated by the dell of the Kinleith Burn being named the "Poet's Glen", where it runs down from beside his cottage at Mid Kinleith Farm to join the Water of Leith, and also by a number of street names, (Thomson Road, Thomson Drive, Thomson Crescent), in the east of Currie. The war memorial was erected in 1919 to a design by Sir Robert Lorimer. The period 1921-1951 brought great changes with the building of more council houses in Currie and private building along Lanark Road. Wider scale development began in the late 1950s and early 1960s with the construction of a private housing estate to the east of Curriehill Road. House builders began to promote Currie as a pleasant commuting suburb of Edinburgh and much house building took place to the north of Lanark Road West. Currie High School was constructed on its present site in 1966 and extensively refurbished and renewed in 1997. There was a short loop railway running over what is now the Water of Leith Walkway. The physical topography has ensured that the original historic core to the south of Lanark Road West including the Water of Leith has remained undeveloped. In March 1972 the historic centre of Currie was declared a Conservation Area. The earliest record of education in the area is contained in the Minutes of Edinburgh Town Council in 1598, when Baillie Lawrence Henderson was sent to "the toun o Currie to help the gentlemen of the Parish select a Schoolmaister"; however it is not stated where the school was situated. In 1694, the heritors appointed a Mr Thomson to teach scholars in the Church until Thomas Craig of Riccarton found a place for the building of a school and house for the schoolmaster. The foundations of the school were laid in 1699. The school and school house cost 500 merks and the salary of the schoolmaster was 20 pounds Scots per year. Currie is served by Currie High School (which has been a Green Flag Eco-School since 2004), Nether Currie Primary School and Currie Primary School, formed by an amalgamation in 2005 of Curriehill Primary School and Riccarton Primary School which shared neighbouring campuses. The largest single Year group since the School's inception, was 1984. According to the School Website this number will probably never be equalled or exceeded. CHS has sought to improve facilities since 2000 with additions of All Weather, floodlit Football Pitches. From the 1970s onwards, Heriot-Watt University moved from its city centre location to occupy the lands of the former Riccarton Estate, gifted to the university by Midlothian County Council in 1966. The move has now been completed and the main campus of Heriot-Watt University occupies and manages a wooded area with enough space for future expansion. Currie has two youth football teams Currie Football Club and Currie Star FC (Currie Star play their games in the Kingsknowe area of Edinburgh). Currie has one rugby team, Currie RFC who are based and play their home games in the neighbouring village of Balerno. Currie has two Scout Groups - the 31st Pentland which has run continuously since 1924 and the 42nd Pentland. On the first Saturday of May The Currie Riding of the Marches takes place. Currie and District Local History Society meets 12 times a year and has speakers on all aspects of the area. The society meets every first and third Monday in the month and their year starts in October. The venue is in the Gibson Craig Hall on the Lanark Road in Currie. The A70 runs through the area and Currie is serviced by the 44 and 45 bus routes, which are operated by Lothian Buses. Currie is served by rail by Curriehill railway station on the Glasgow-Edinburgh via Shotts Line. Currie is also close to the City of Edinburgh bypass and is bordered by the Union Canal to the north and the Water of Leith to the south. Edinburgh Airport is located approximately 4 miles north of Currie and the M8 motorway to Glasgow is around 2 miles north. It also has connections to Livingston in West Lothian through E&M Horsburgh service 24, between Juniper Green and Livingston. The parish church lies south of the current main road, amongst a small cluster of buildings which represent the original village. It was built in a simple rectangular form, with a pediment on its north (entrance) side and a low central spire, in 1784 by James Thompson of Leith. Its interior was remodelled in 1835 by the Edinburgh architect, David Bryce, and in 1848 the windows were enlarged by the architect David Cousin. As the graveyard pre-dates the church it is presumed that the church replaced an earlier church. The graveyard is laid out in three sections: an original section around the church including several interesting carved stones from the 17th and 18th centuries; a Victorian section on a raised tier; and an attached, but separately walled cemetery to the south, containing 20th century graves. The war memorial. which adopts the form of a medieval market cross, stands near the entrance to the church. It was designed by Sir Robert Lorimer and added in 1921. Brigadier General Ernest Craig Brown, who gives his name to the military march "Captain Craig Brown"
^ "Currie Community Council". Retrieved 2012-06-24. ^ "The Edinburgh Gig Archive - Odds & Ends". www.edinburghgigarchive.com. Retrieved 2018-08-07.